One thing about beagles – they have a very distinct sound. Our subdivision has several of them and they are easy to distinguish from the Jack Russells who get walked each night. Beagles woo-woo, Jack Russells clack. Our Miniature Pinscher screams as he tears around the yard. The Labs and Golden Retrievers make little noise – I envy their owners. 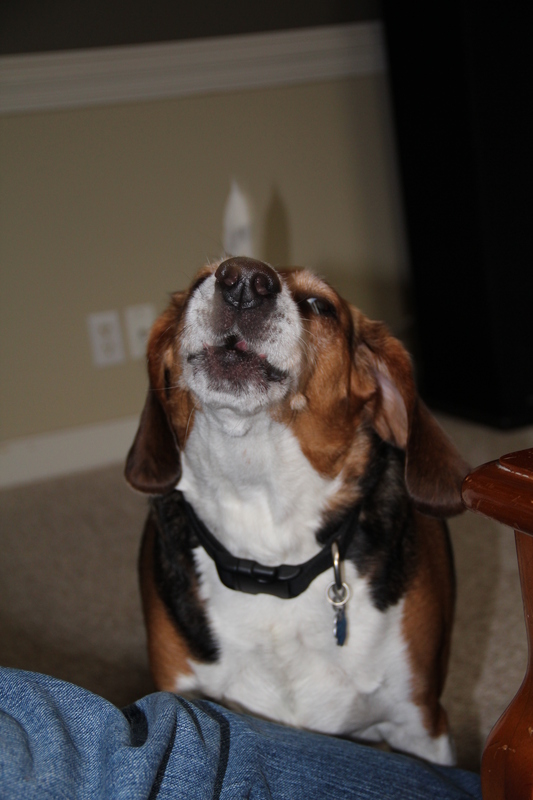 But there is nothing like the distinct sound of a Beagle as they bay / howl / woo-woo. And if their daddy starts rough housing with them, they are liable to do it right inside the living room. I caught this picture by using the continuous shooting setting on my camera. I don’t remember how many I clicked off, but I managed to capture the perfect pucker. Word for tomorrow – FILM. If you prefer to work ahead, see the list for the week under “A Word A Day”.